TUPPERS PLAINS, Ohio —And then there was one. 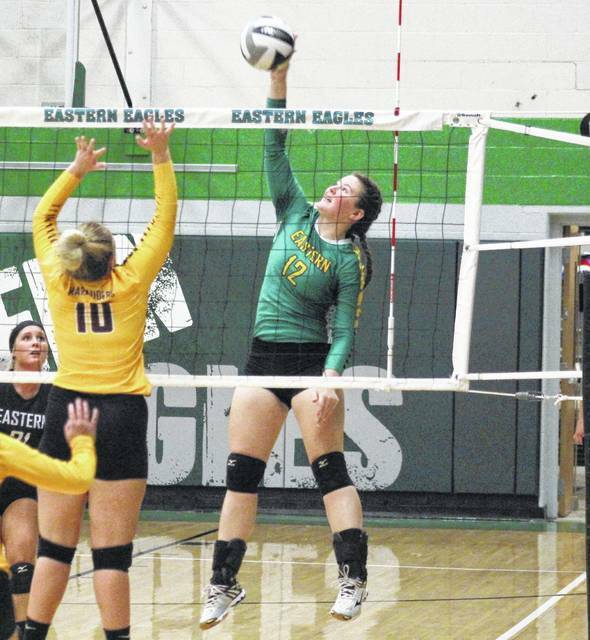 Eastern became the last unbeaten volleyball team in Meigs County, on Thursday night at ‘The Nest’, as the Lady Eagles handed non-conference guest Meigs its first setback of the season, by a 3-1 count. The Lady Eagles (2-0) never trailed in the opening game, leading by as much as 10 en route to the 25-18 win. Meigs (1-1) led early in the second game, but a 9-0 stretch gave the hosts an 11-4 lead. Eastern outscored the Lady Marauders by a 14-12 clip over the remainder of the second, giving EHS the 25-16 win and the 2-0 advantage in the match. After 36 points in the third game, the teams were tied for the fifth and final time, at 18. From that point, Meigs scored the next five points, and seven of the next eight. The Lady Marauders won the third by a 25-19 count, forcing a fourth game. In the fourth game, the Lady Eagles led by as much nine on their way to a 25-18 victory, capping off the 3-1 win. The Lady Eagle service attack was paced by senior Sidney Cook, with 14 points including a pair of aces. Allison Barber was next with 10 points and three aces, while Morgan Baer, Mackenzie Brooks and Kelsey Casto each had six points and two aces. Morgain Little marked five points and two aces in the victory, while Jenna Chadwell contributed one service point. Maci Hood led the MHS service attack with nine points, including a pair of aces. Kassidy Betzing and Baylee Tracy recorded eight service points apiece, with Tracy picking up an ace. Maddie Fields marked three service points in the setback, while Marissa Noble and Hannah Durst both added two points, with Durst earning an ace. At the net, Eastern was led by Barber with 11 kills and two blocks. Brooks posted nine kills and two blocks, Little added four kills, while Baer had two kills and a team-best 26 assists. 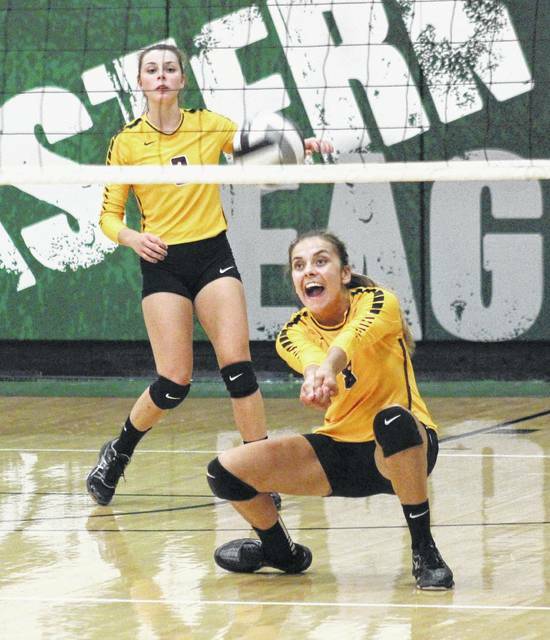 Elayna Bissell led the EHS defense with 32 digs in the win. Betzing led the Lady Marauders at the net with 10 kills and five blocks. Next was Paige Denney with nine kills and two blocks, followed by Marissa Noble with seven kills and one block. Hood posted four kills and one block for MHS, Fields added two kills and a team-best 31 assists, while Durst chipped in with one kill. Meigs continues non-league play on Monday at Belpre. 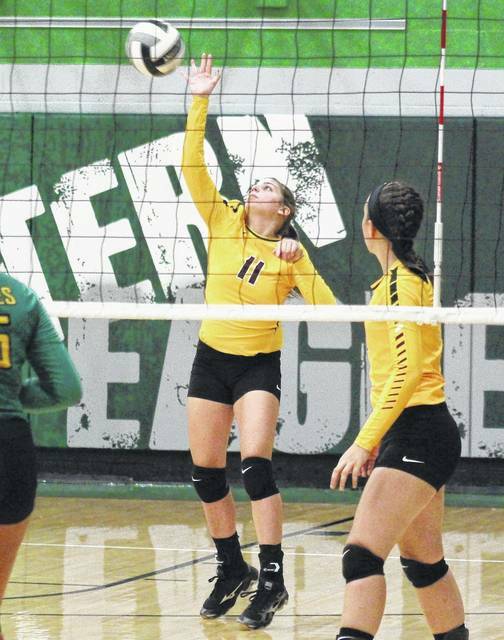 After the Athens Invitational on Saturday, the Lady Eagles will open Tri-Valley Conference Hocking Division play on Thursday, at Waterford. 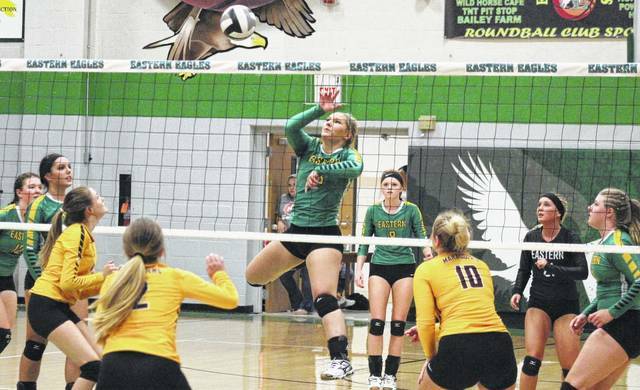 Eastern senior Sidney Cook (center) spikes the ball over the net during the Lady Eagles’ victory over Meigs, on Thursday in Tuppers Plains.